Moscow Mayor Yury Luzhkov has all but officially declared his own hypocrisy regarding a series of opposition rallies that the city has routinely banned since their inception last May. In an interview published Wednesday by the newspaper Izvestia, Luzhkov said that the opposition’s chosen place of protest was unsafe for several thousand people to gather – this apparently in spite of his approval to allow three thousand pro-Kremlin demonstrators to gather there last week. The interview came in the wake of the March 31 iteration of the Strategy 31 rallies, a series of demonstrations held by the Other Russia opposition coalition in defense of the right to free assembly. The mayor’s office has routinely denied sanction to the rallies on the basis that the oppositionists’ traditional space of protest, the centrally-located Triumfalnaya Square, has always been reserved for other events. In a slap to the face for the oppositionists, last month’s event turned out to be a gigantic youth rally lead by the notoriously fanatical pro-Kremlin group Nashi. Outraged oppositionists and human rights activists accused the mayor of deliberately creating conditions that could lead to a violent mob, citing the example of a tsarist-era tragedy on Moscow’s Khodynskoe Field where more than a thousand people were trampled to death when a panicked rush broke out. Speaking to Izvestia in reference to Strategy 31, Mayor Luzhkov insisted that while the freedoms of speech and assembly “are among the main components of democracy,” they should not hinder other people’s right to normally live their lives. Therefore, when several thousand people announce that they’re planning to attend a rally on the relatively small Triumfalnaya Square, it poses a serious risk of impeding traffic, he said. How he reconciled this with the pro-Kremlin rally was unclear. In reality, each Strategy 31 rally has ended with police beating and detaining scores of protesters, who are often denied medical attention after being stuffed into police buses. Ambulances routinely appear outside police stations later on to take away wounded activists. 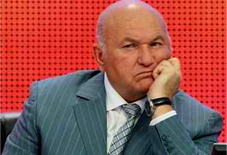 In any case, Luzhkov admitted that outbreaks of violence were certainly possible. “There are such examples in the history of Moscow. Remember Khodynskoe Field,” he noted. The mayor went on to assert that the city has never actually banned the rallies, but simply required them to be held somewhere farther from Moscow’s center, “where people can feel more comfortable and safe.” Oppositionists maintain that not only is Triumfalnaya Square safe for a large number of people, but that the whole point of holding the rallies is to inform Russians about their constitutional rights, and holding them somewhere that’s not centrally located couldn’t achieve that goal. Luzhkov disagreed. “Why do the ‘discontented’ insist on Triumfalnaya Square?” he asked. “So that arguments with the authorities become a point of conflict… ‘Look how they suppress us.’ They are not interested in the rally being sanctioned, but in it being banned. They want a scandal. But their freedom should not hinder the freedom of other people to calmly live and work, for traffic to move calmly, finally,” he concluded. In the end, Strategy 31 organizers chose to hold their rally, unsanctioned as usual, together next to the pro-Kremlin youth rally. Most oppositionists, however, arrived with flowers to commemorate the victims of Moscow metro attacks days earlier on March 29. On the other side of Triumfalnaya Square, the three thousand young Russians danced to loud rap music and declared their faith that Russia would defeat terrorism. Regardless of the fact that Triumfalnaya Square was obviously capable of holding several thousand people and that the Strategy 31 activists, who that day numbered less than a thousand and carried no political insignia or banners, were holding what was largely a memorial for the dead, police detained between 40 and 50 of them. Many were beaten and severely injured. While Russian law prohibits participation in unsanctioned rallies, rights organizations and governments worldwide, including the United States and the Council of Europe, have criticized Russia for failing to observe the right to free assembly and using excessive force against the Strategy 31 participants.